More than 2,000 Scientologists gathered on L. Ron Hubbard Way in Los Angeles on Saturday, October 3, to celebrate the dedication of the Fountain religious retreat—the next step in a year of unprecedented expansion for the Scientology religion. The inauguration of the Fountain, on Saturday October 3, marked the grand opening of ideal accommodations created expressly to serve the record numbers traveling to Los Angeles to progress through the upper levels of Scientology. 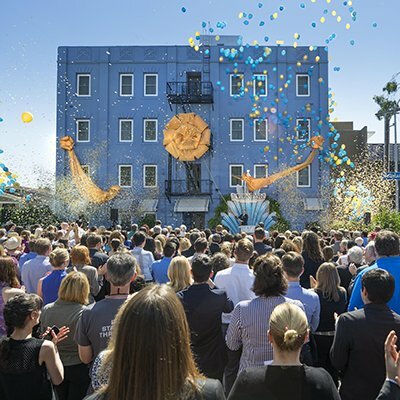 A year of unprecedented advance rolled forward for the Church of Scientology, with the grand opening of the Fountain religious retreat on L. Ron Hubbard Way in Los Angeles. The inauguration of the Fountain religious retreat was met with great enthusiasm from the more than 2,000 Scientologists present. Attendees streamed in to tour the Fountain religious retreat—established to provide a distraction-free environment for those progressing through advanced Scientology services. Located at the intersection of Fountain Avenue and L. Ron Hubbard Way, the Fountain religious retreat is an exciting new addition to the Ideal Pacifica Bridge. The Fountain reception welcomes Scientologists from across the Americas who travel to Los Angeles for advanced Scientology training and auditing. The Fountain provides comfort, convenience and a distraction-free environment for Scientologists traveling to Los Angeles for Scientology training and auditing. Just steps from the Advanced Organization of Los Angeles, every room of the Fountain is perfectly configured for parishioners to audit themselves to the state of Clear and OT. Each room is designed to provide the ideal environment for maximum progress through Scientology services. The Fountain patio provides a tranquil setting for parishioners on break from study or between sessions. The Ideal Church of Scientology Los Angeles welcomes visitors for a first introduction to the religion. The Ideal American Saint Hill Organization is where Scientologists advance through the legendary Power Processes and Scientology auditors perfect their skill on the Saint Hill Special Briefing Course. The Ideal Advanced Organization of Los Angeles is the Gateway to OT for all ascending the Bridge on L. Ron Hubbard Way. With Scientologists traveling to L.A. from all corners of the Americas, the Church of Scientology dedicated a new religious retreat October 3 to provide the ideal environment for their journey to higher states of spiritual awareness and ability. A year of unprecedented advance and expansion for the Scientology religion moves forward unabated with the dedication October 3 of the Fountain religious retreat, created expressly to serve the record numbers traveling to Los Angeles to progress through advanced Scientology spiritual levels. Just steps from L. Ron Hubbard Way in Hollywood and the Churches where these Scientology spiritual services are offered, the Fountain religious retreat provides Scientologists comfort, convenience and a distraction-free environment—a place of quiet where they can rapidly progress through their training and auditing (spiritual counseling). Each of the 59 studio apartments and single-bedroom suites is perfectly configured for parishioners to audit themselves to the state of Clear and OT. The Ideal Pacifica Bridge is the Scientology complex that spans the entire range of Scientology services on L. Ron Hubbard Way. It begins with the Ideal Church of Scientology of Los Angeles at the intersection of Sunset Boulevard and L. Ron Hubbard Way—where Scientologists and those first learning about the religion progress through all the fundamental levels of the Scientology Bridge to Total Freedom. Adjacent to the Church of Scientology of Los Angeles, the American Saint Hill Organization, ASHO, takes Scientologists through the next phase of their journey with legendary Power Processing. It is also here that Scientology ministers and ministers-in-training perfect their skill on the Saint Hill Special Briefing Course. And finally, the Ideal Advanced Organization of Los Angeles, where Scientologists embark on their journey to higher states of spiritual awareness. The dedication of the Fountain religious retreat provides parishioners the ideal setting they need to ascend the Bridge on L. Ron Hubbard Way. The opening in April of an Ideal Church of Scientology where France, Germany and Switzerland converge: in Basel, Switzerland. More openings are planned in Australia, Africa, Europe and North America in the year ahead.